Here at Las Vegas Guest List we are all about making sure you have the best time in Sin City! We want to make sure that Vegas isn’t just a vacation, but also an unforgettable and exciting experience! Chris Hornak’s first priority is ensuring your group gets into the best nightclubs, day clubs, and strip clubs in Vegas as the true VIPs you are! As a result, Las Vegas Guest List is constantly expanding and we are proud to announce the addition of our free Drai’s After Hours guest list! Drai’s nightclub is one of the best and most luxurious dance clubs in Las Vegas, and it will surely blow you away! Drai’s rooftop oasis has given new definition to the Vegas entertainment experience. Located at The Cromwell Hotel, Drai’s Nightclub provides you a view of the entire Strip as you party the night away. An electrifying club with a meticulous emphasis on detail and decor, Drai’s creates a multi-sensory experience unlike any other nightclub in Vegas. Created by Victor Drai, Drai’s is a 65,000 square foot venue that takes clubbing to new heights. With heavyweight artists such as Chromeo, 3Lau, Adventure Club, Dyro, and The Weeknd. This club has undoubtedly set a new bar of excellence among Vegas nightlife and after hours venues. Whether you’re familiar with the nightlife industry or not, everyone is talking about how Drai’s has quickly become one of the most popular nightclubs in Sin City. Featuring world famous electronic music producers and a growing list of live shows by award winning musicians, Drai’s has taken nightlife into new territory. Remolded with a clubgoer’s experience in mind, Drai’s incredible venue magnetizes hundreds of Vegas locals and tourists a night. This nightclub features over 7,000 square feet of the most state of the art LED lights and elegant decor! 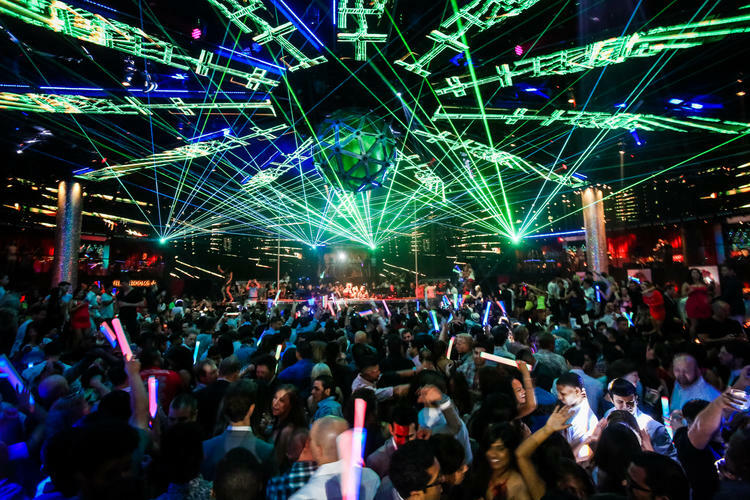 Drai’s is consistently praised for having some of the best production effects such as panoramic jumbotrons, confetti blasts, lasers, dancers, and lighting that will excite the senses and keep the party vibe alive. Drai’s is a critically acclaimed nightclub with impressive line-ups, breath-taking light shows, and a sound system that will keep you dancing until the sunrise. [guestlist message=”Palms, Pure, LAX or Voodoo required first night. Over 25 clubs, pools and strip clubs available after.